Earlier I blogged about making a toolbox for my son for Christmas and loading it up with some basic tools. Today the two of us made another project together, using just his tools. I have to tell you about this book we picked up, it’s a great project book for kids in my opinion. It has “launchers” and “shooters” and all kinds of interesting toys to make. The instructions are clear and straightforward. I like it a lot. 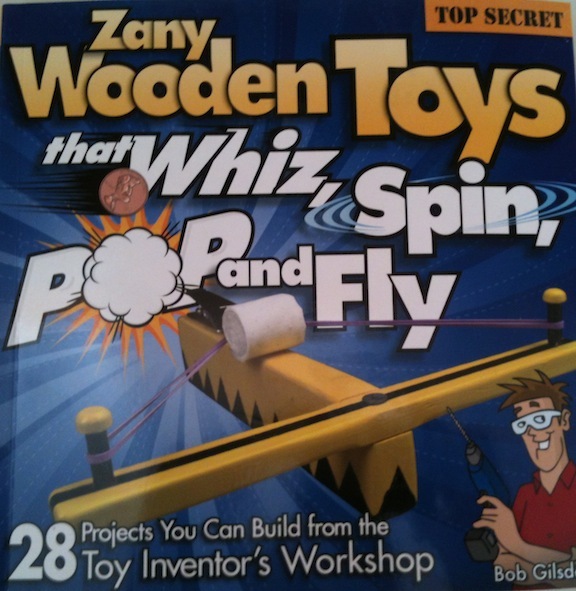 It’s available on Amazon, although I discovered it at Woodcraft. 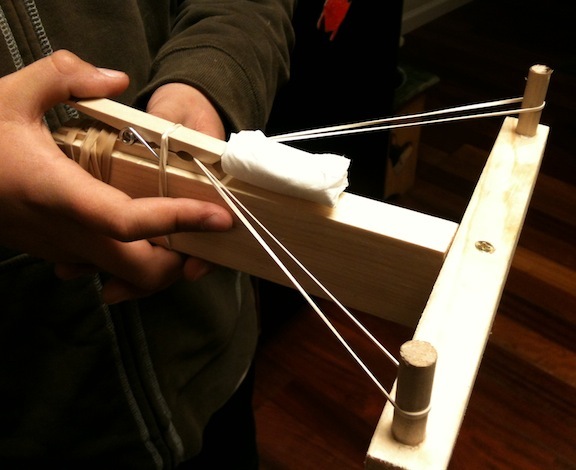 Our first project out of the book was the “tissue launcher” that is on the cover. Kolya cut out the parts using his new coping saw, and he did a really nice job with it. Then he used his block plane to smooth all the edges. He really liked planing, and did a great job on that too. Even on the end grain, he had it smooth as silk. The plane I one I picked up on the cheep, and lapped in the base and sides, flattened the back of the blade and gave it a razor edge. It worked well on the Pine boards we were using for this project. He used his eggbeater drill to bore the holes (note to self: brad point bits don’t work well in that drill, they catch too easily and it’s hard to turn). The project went together really quickly, and he couldn’t wait to try it (not even to paint it). Truth be told, I was eager to see it work too. It will shoot a rolled up wad of tissue 15 or 20 feet easily. All in all, a fast, fun project. I’m looking forward to doing the next one! I don’t know about you, but every once in a while nothing seems to go right in the shop. Yesterday was one of those days. It started off simply enough. 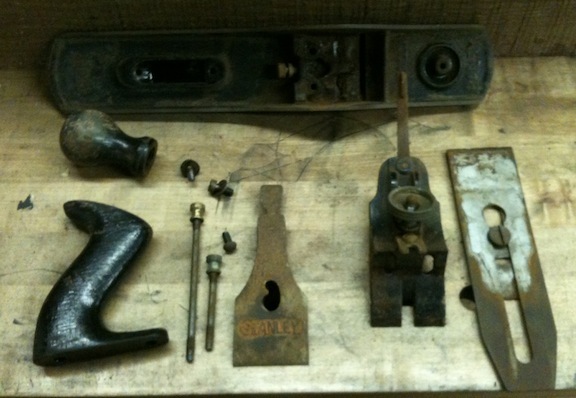 My workbench project in on pause until the Stanley #8 I bought on ebay arrives. Hopefully today. I decided I “needed” that to flatten the faces of my timbers for the bench top the last little bit. I decided to do a simple project yesterday morning, to make a marking gauge after I saw a video on another blog. Now when I say simple I mean simple for anyone with basic coordination and opposable thumbs. Yesterday I had basic stupidity and was all thumbs. I won’t bore you with the details of my misadventures, but I have to wonder what causes that? Some days things go very smoothly in the shop. Most days I think. Then there are those days where nothing seems to go right. Often there is blood involved. Usually mine. What causes that? Not enough sleep? Not enough coffee? Too much coffee (as if)? Biorhythms? I wish I knew and coud banish those evil spirits. 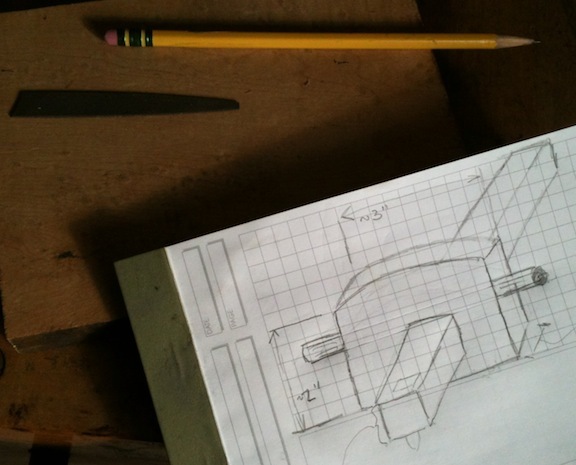 Things started off well enough, I sketched out what I wanted to make, and found a nice piece of scrap to use. Birdseye Maple left over from a table I made with power tools several years ago. A piece of a broken file from my junk box to use for the blade. 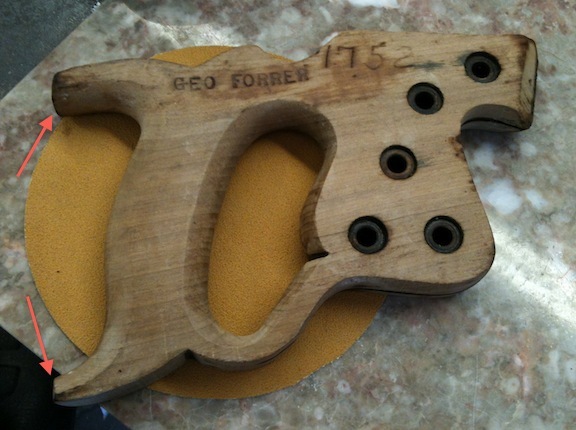 This particular style of gauge uses a round pin that intersects the square hole at a slight angle to wedge the arm. The dowel has a small notch cut for clearance when it’s loose. I ripped a length of the wood using my cheap big box pull saw, and planed it square. That went well, although Birdseye isn’t the most plane-friendly wood. The fact that my bench is loaded with the timbers for my new workbench, and the constant wiggling and swaying didn’t help. But I took it all in stride. I absolutely love the finish the plane leaves, sanding doesn’t improve this. I cut our a 2″ x 3″ square, flattened two faces and trued three edges (knowing the the last edge would be rounded over later). I laid out the hole for the adjuster arm, drilled it and chopped out the waste carefully. I got a nice, even, non-wiggling fit. I was really happy. I’d never chopped a mortise by hand. I don’t even have mortise chisels. Back in my power tool days I had a hollow chisel mortiser. That made things easy, fast and accurate. This is where things went downhill. 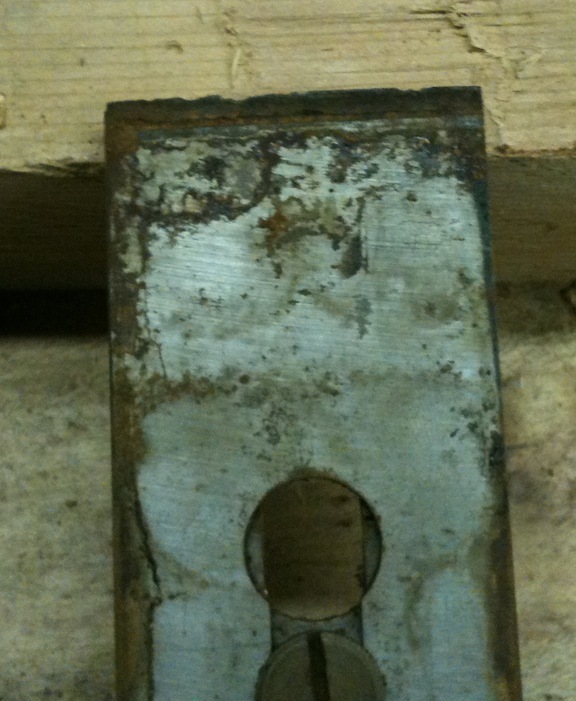 I got the angle of the cross hole wrong and ruined then mortised piece. Dang. Taking a breath I thought I’d just re-make that part. To speed things up I thought I’d “cheat” and use my drill press to bore the starter hole for the mortise instead of my bit and brace. And of course I neglected to use a vise or clamp the part. It caught on the bit and whacked my thumb – opening a bloody gash. Stupid. Stooooopid. I know better, but got in a hurry. After collecting myself I proceeded to chop out the mortise in the replacement piece. Unfortunately I was getting bloody drips on the part. And the mortise ended up too loose. So it wiggles. Today I’l clean up my mess and make a fresh start on this project. The root problem is loosing focus – although I don’t know what causes that. The paint came. Tape went on. Paint went on. Tape came off. Parts went on. I like it. And it’s a far cry from the rusty mess I started with. 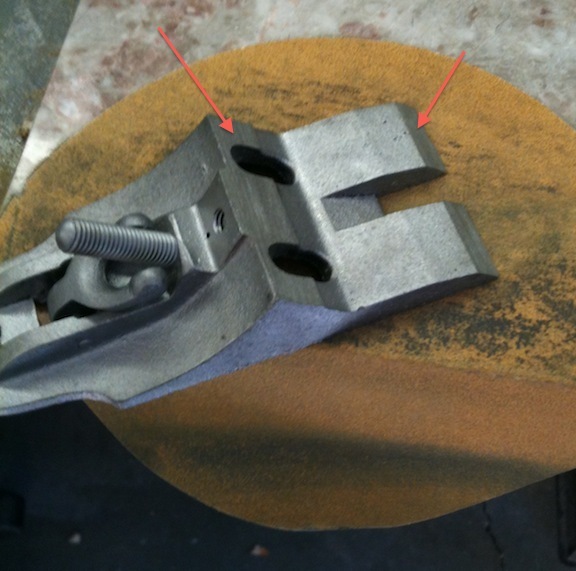 Restoring an old tool like this is really gratifying. I haven’t made any cuts with it yet, the paint isn’t cured, and the finish on the handles isn’t completely dry. And yes, I went with the original handles, stained and varnished. At this point I’m just about done with the “restoration” of the #5 Stanley. I should get the recommended “semi-gloss black Ford engine paint” delivered tomorrow, all I need to do is paint the frog and body, and re-assemble it. I picked up a replacement rosewood knob and tote from thebestthings.com. At the same time I’ve been playing with the original handles. After stripping the black paint I sanded them with 220, then soaked them overnight in a mix of danish oil and mahogany gel stain. This is the result. I’m in the process of applying a few thin coats of wiping varnish to build up some gloss, but they aren’t too bad. They look better in person than in this picture. The other knob and tote are the Rosewood replacements I got. I lapped in the sole, of course. The bottom looked flat when I checked it with a straightedge – I couldn’t see light anywhere – but it was pitted and ugly. I started with 80 grit, then 180 and 220. I may do a bit more before I paint it, but I think it’s more than OK.
Next I attacked the blade and chip breaker. 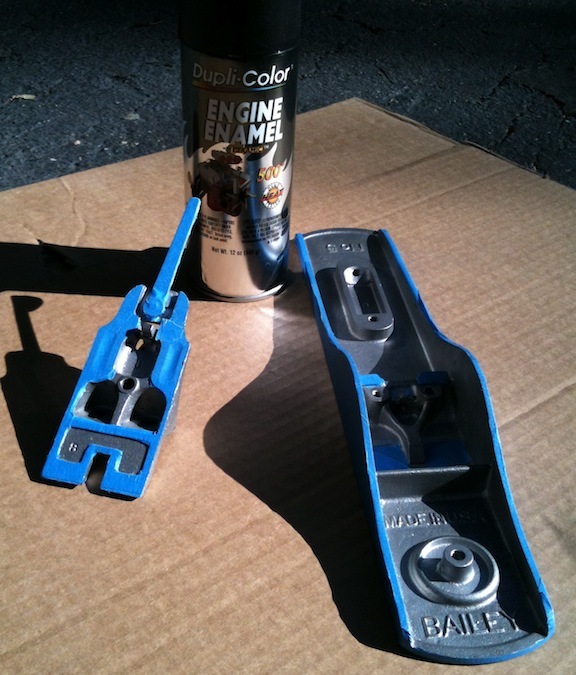 I stripped the rust, painted the back of the blade with blue Dykem and scribed a 7″ arc. 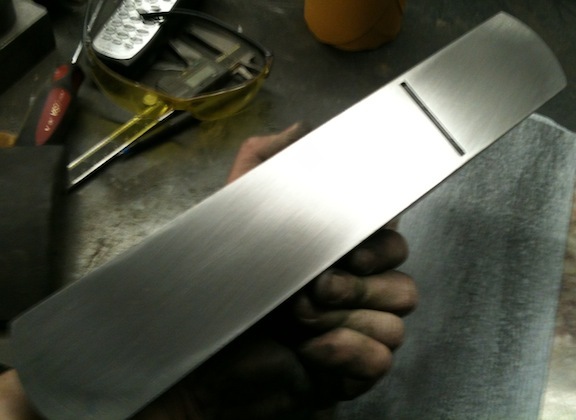 I want this blade to be cambered for roughing in stock. 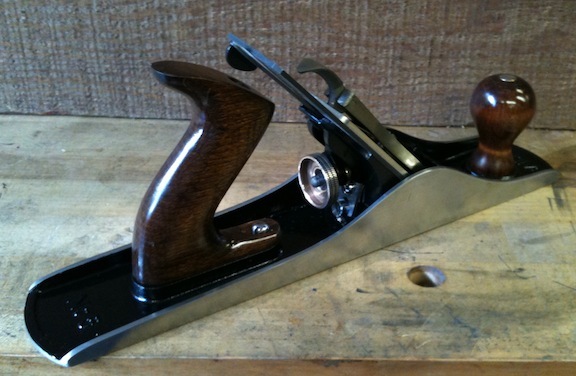 I have another blade and chip breaker from Ron Hock that I’ll also use in this plane. Then off to the grinder. I use a Burr-King belt grinder, here with a new 40 grit belt. There is nothing like a Burr-King. They aren’t cheap, but they are powerful, smooth and accurate. I ground the edge until I got an even space around the line, then worked it down right to the line. 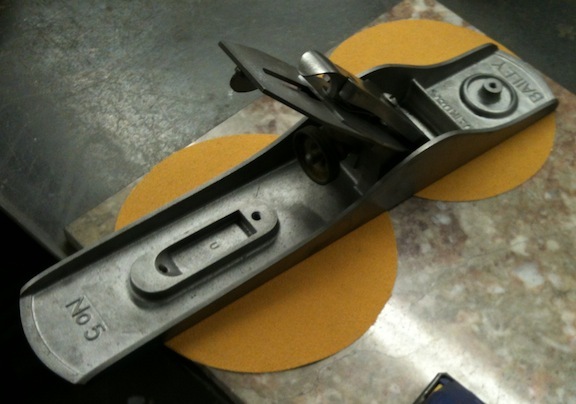 The tool rest is set at 90 degrees to the belt/platten for this step. The blade never got past warm. After I had the curve ground in I used a worn 220 slack belt (no platten) to put a shine on the edge. 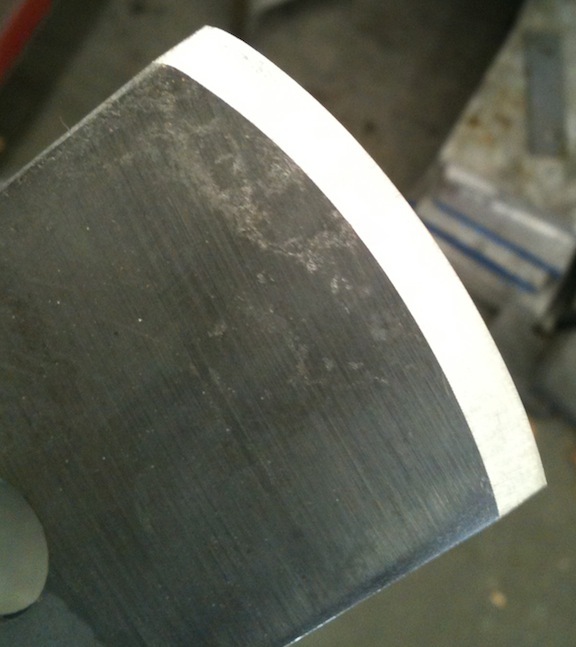 I used the width of the shined edge and the width of the bevel in the next step where I grind in the bevel. I set the tool rest to 25 degrees to grind in the bevel. I made light passes, checked the the heat in the part after each pass and checked my progress. I wanted to have an even bevel and to take the edge down just leaving a “shine” on the cutting edge, without any appreciable thickness and certainly no sharp edge. This is just the rough grind. Sorry about the focus. 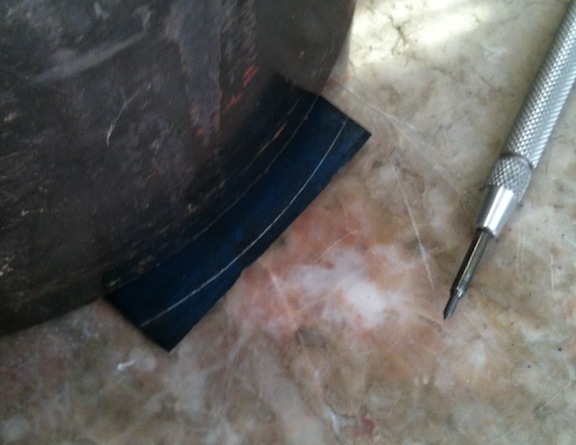 Next, the back of the blade needed to be flattened. 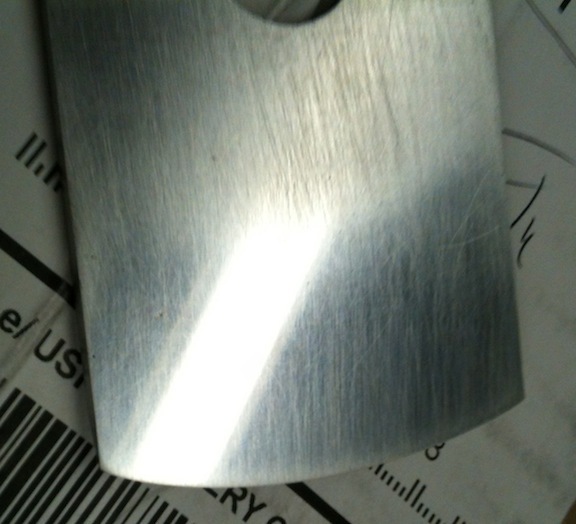 Since the blade was pitted I started with 80 grit, then 180, 220, 400, 600 and 1,000 grits. Before and after, you can see how nasty it was to start with. 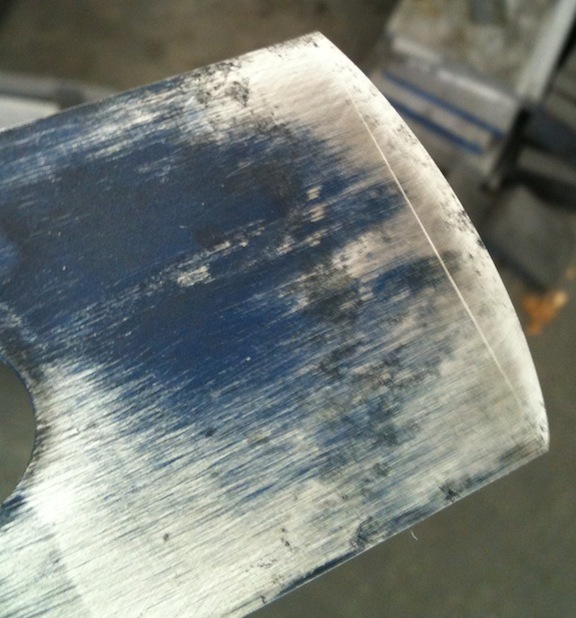 I had to free-hand sharpen the blade, but it wasn’t too bade. 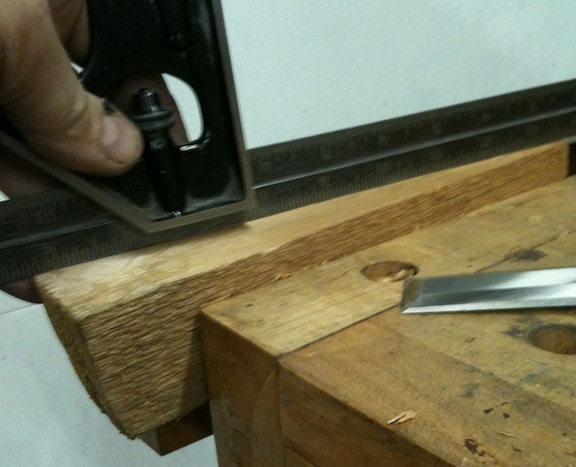 This blade is for rougher work, to either follow a scrub plane or to use instead of a scrub plane. I test fit the chip breaker to the iron, and there was a big gap. I had to bend the chip breaker a little so the the edge would even touch the blade. Then I lapped it with 220 until I hade an even shine across the edge. That gave me a nice tight fit. I think this is going to be a nice plane when I’m done. If I had to pay myself for the labor to restore this plane I think I would have been miles ahead to just buy a new lie-nielsen. Luckily I do this for fun and it’s been an enjoyable project. I picked up a D8 rip saw recently. Like my Stanley #5 that I’m reworking, this isn’t old enough to be collectable, and isn’t ready for immediate use either. I suspect that it’s never been re-sharpened, and luckily it’s nice and straight. Not pretty, not sharp, but straight without any kinks or broken teeth. The finish on the handle is flaking off, and the fasteners are all crusty. 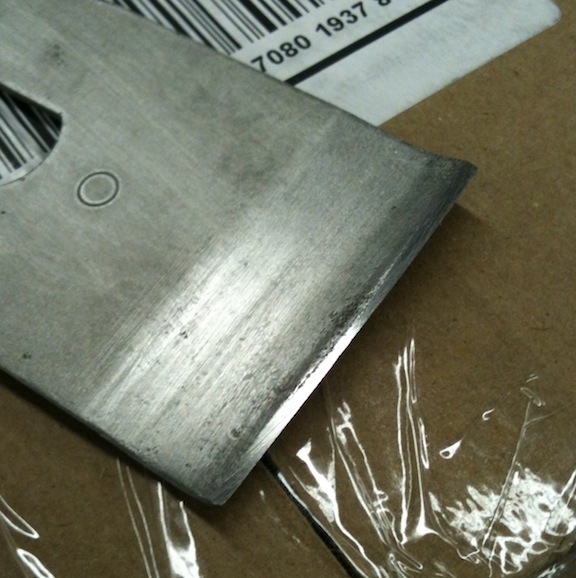 The blade has some minor pitting, but not too bad. I was expecting/hoping that the handle bolts were brass, but they are just chromed. Or were chromed. I striped the finish off by soaking it in lacquer thinner for a few minutes and scrubbing it with a coarse steel wool pad. Someone stamped their name into the handle, I’ll sand it off but I expect it will show up when I finish it. The wood looks like cherry! Also, the horns are too blunt, no style. I’ll sand more curve into them so they come to a crisp point. After sanding out the name, shaping the horns and sanding everything to 220 grit I sank the handle into a bag of danish oil (linseed oil plus varnish) and let it soak for an hour. 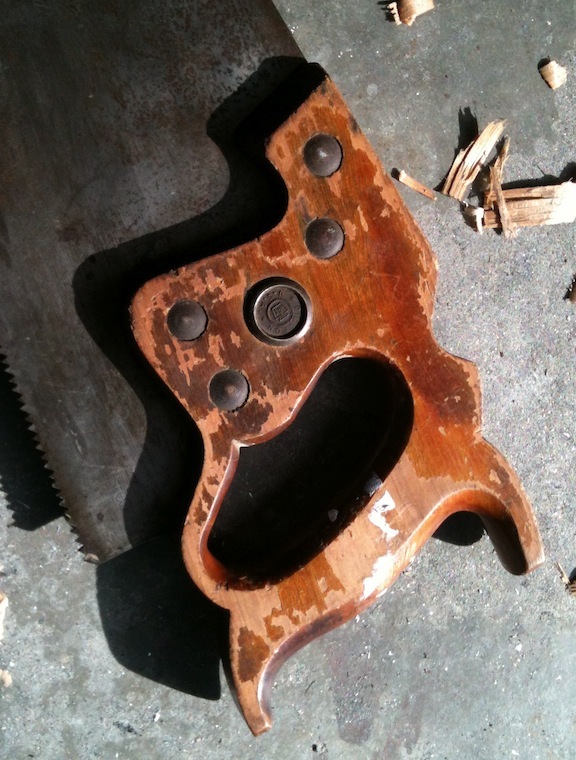 Meanwhile I cleaned up the saw plate. I went over it with “Navel Jelly”, which cleaned up some of the rust, but it’s pretty weak results. I knew that from past experience, but it was the only rust remover they had at the local hardware store. I went at it twice with the rust remover, lightly scrubbing it with a brass brush and letting it sit for 20 minutes between applications. After I washed off the second application I dried the saw plate and got out the “wet-or-dry” sandpaper. I sanded both faces starting with 220, then 320 then 400 then 600 grits, using WD-40 to “wet sand” it. Then I needed to clean up the saw nuts. I chucked each one up in my electric hand drill (one at a time) and spun it into a piece of 600 grit sandpaper that I held in the heel of my other hand. 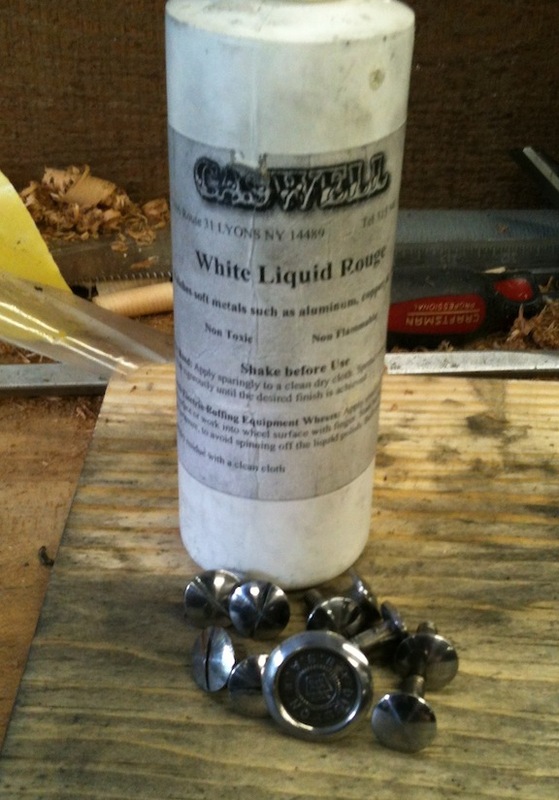 Then I spun each one into a rag that had a spot of liquid white rouge on it. They cleaned up reasonable well. Then I re-assembled everything. The handle will need several more coats of oil to finish it off nicely. Overall it looks nice I think. 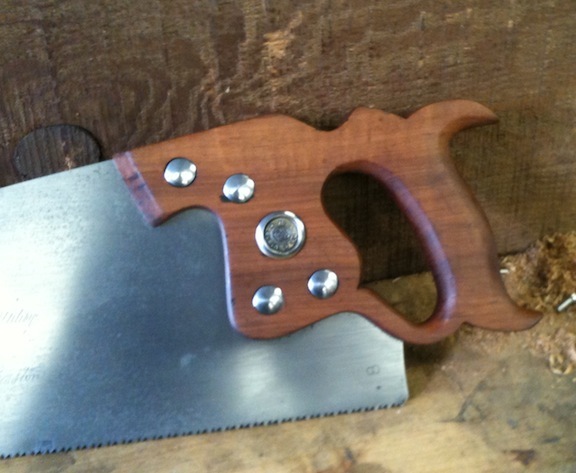 The saw plate is nice and bright and the handle looks much better. Of course it’s still as dull as a grade school drop out, but I’m going to pack it up and ship it to Bad Axe Tool Works to be jointed, set and sharpened. I read about how to sharpen a saw, and while it seems easy enough I want to get a feel for a properly sharpened saw before I try my hand. I can’t wait to get it back, sharpened! Check out the “improved” horns, that makes me happy. Well, actually “restoring” is the wrong verb. This plane isn’t particularly collectible, and collectors might not approve of my approach. Whatever. My goal is to make it work right and look sharp. No pun intended. All of the parts were dirty and rusty. Luckily I know how to fix that. A few minutes in the bead blast cabinet and everything was clean and rust-free. I started with the clamp-thingie, most of the chrome was rusted off, and I tried to make sure I blasted off any remaining flecks. Then bead blasted. I use 220 grit beads at about 120psi. Better. You can see where the rust has eaten away the surface. Then I sanded it with 220 and 320 grit. I am shooting for a satin or brushed finish. On the lever cap. My hands are OK as-is. I’ll probably work this a bit more and see if I can get rid of more pits. Then I’d like to have it nickel plated, there is a shop near work that does electroless nickel plating. Maybe paint in the background around the lettering? I also blasted the plane body, frog, blade and chip breaker. Clean is good. The “japaning”, which apparently is an asphalt derivative, took a little extra work to remove. It stuck in a few recessed spots, so I scraped it with a screwdriver and blasted it again. Now I can start improving things. 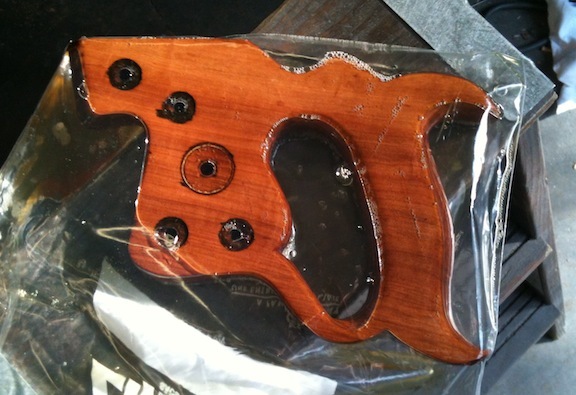 I watched Rob Cosman’s “Great Handplane Revival” and picked up a couple of tricks. First I wanted to make sure the face of the frog that supports the blade was absolutely flat. In the DVD Rob removed the lateral and depth adjusters. I don’t think that’s necessary. I put some sandpaper on a piece of marble, right at the edge. By sliding it side-to-side while rotating it I was able to sand the entire surface. Just hang the protuberances from the adjusters over the edge. You don’t have to do a lot, just sand it enough to get an even scratch pattern on the surface. Here I’m flattening the surface for the blade. The two red arrows show the surfaces that will need to be lapped in the next step. I’m using 80 grit for this step. Next lap the two frog attachment surfaces. Again, don’t go crazy, just get to an even scratch pattern. Just slide it side-to-side with moderate pressure. 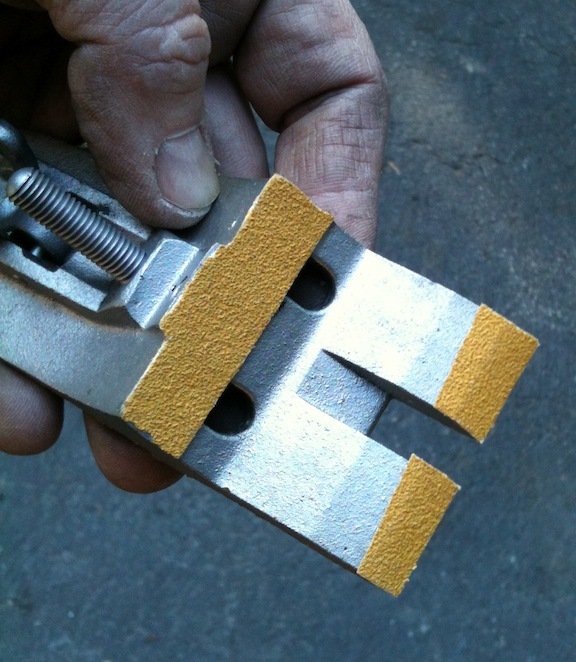 Finally, attach some sandpaper to the frog attachment points. Then seat the frog into the plane body and rub it back and forth. This ensures that the attachment points in the plane bed are a mate to the frog. After three sets of sandpaper (I used 180 for this step) I was satisfied with the seating area in the plane bed. I’m ready to lap the sole and sides next, but that is for another day. I also striped the paint off the knob and tote. As expected, the wood is nothing special. I’ll sand them, stain them and see how they look. I expect I’ll be scrounging some nicer bits to replace these. 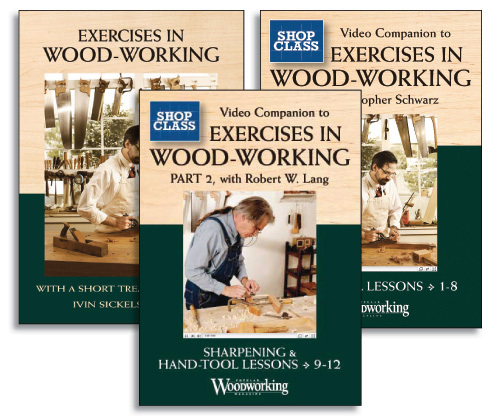 I’d mentioned earlier that I bought the “Exercises in Wood-Working” book+DVD set for my brother-in-law for christmas. It came is just under the $50 gift limit, on special and with free shipping. This morning I decided I’d add a chisel and a block of practice wood to the package. The first few exercises in the book require a chisel. I stopped by “Drew’s Used Tools” to see if I could pick up a decent used chisel. Sadly, every time I go there I’m disappointed. Rusty, abused, broken low quality tools. There was one chisel that had potential, the rest were junk. For the princely sum of $1.99 I was the proud (if temporary) owner of a beat up chisel. The blade is actually nicely made, it has a large shoulder and tang so it should be pretty stout. The handle, not so much. I stoned all of the faces to get most of the rust off. The back I worked until it was flat and free of pits. 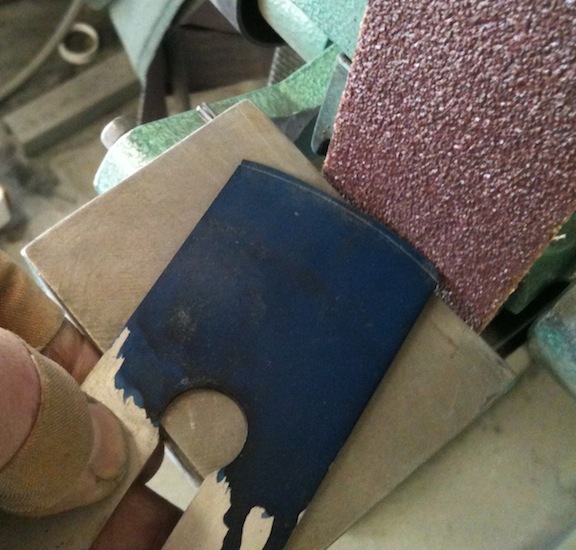 I worked the back up to 1,000 grit sandpaper, ground a new bevel and sharpened it. Sanded the handle, stained and oiled it. If I had a little more time I’d think about making a better handle, but this will suffice. It’s very sharp. 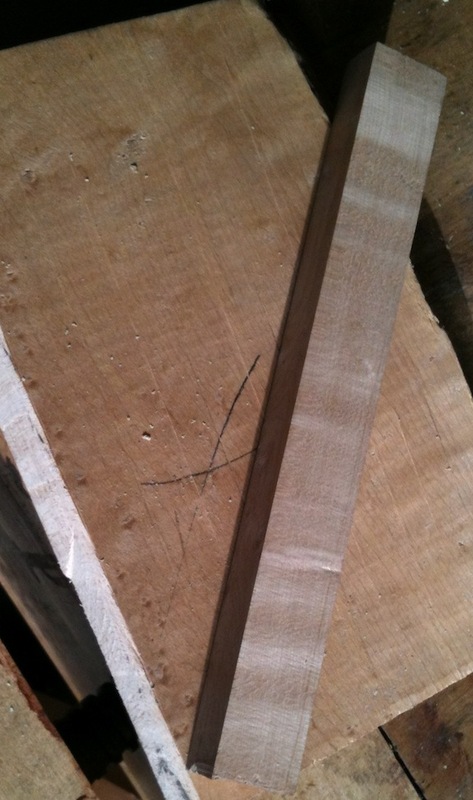 Sharp enough to pare across end grain on this really soft western red cedar that I have. 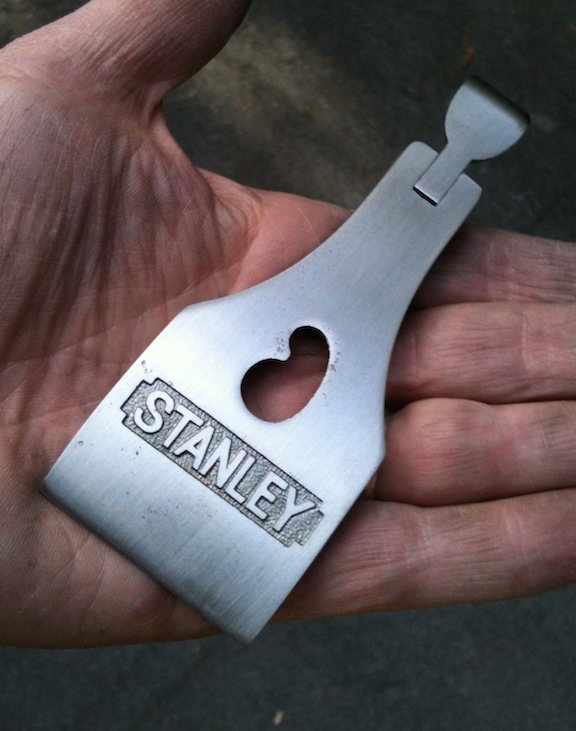 I also did a lot of work on the Stanley #5 restore today, but that will have to wait until tomorrow. I have a new-ish Stanley #5. Yep, plastic tote, plastic front knob, plastic depth adjuster. No adjuster on the frog, just loosen the screws and slide it around. The blade vibrates like a tuning fork, and it doesn’t even begin to hold an adjustment. But it looks like a plane. So I decided to upgrade. Seriously. $14.50 on ebay. With shipping. I don’t know the vintage on this plane, but it’s certainly not a “collectable” vintage. The knob and tote are painted black over wood, and I believe that is the original finish. 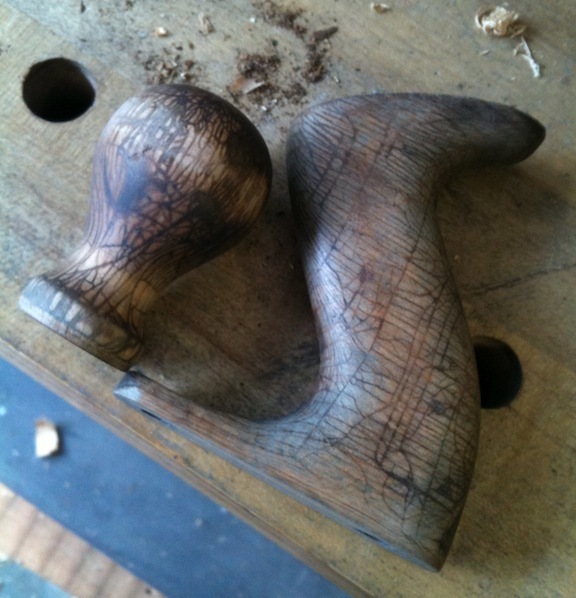 I removed some of the finish from the knob, and it’s certainly not rosewood hiding under there. But it has a metal blade adjuster and a frog adjuster. I think it will make a fine upgrade, especially after some clean up, a fresh Ron Hock blade and perhaps a little hot rodding. I pulled most of it apart, which took perhaps 45 seconds. The last thing I disassembled with an eye toward improving was an Ironhead Sportster. That took longer. So, what do we have? A lot of dirt and rust. But at this point all the parts are accounted for and nothing seem broken. The lateral adjuster is tight. The wood is solid — if nothing else I can refinish that. But I have a replacement Hock iron already, so I’m good there. I checked the sole with a straightedge and it needs a little flattening, but it’s straighter then the new #5 was out of the box. 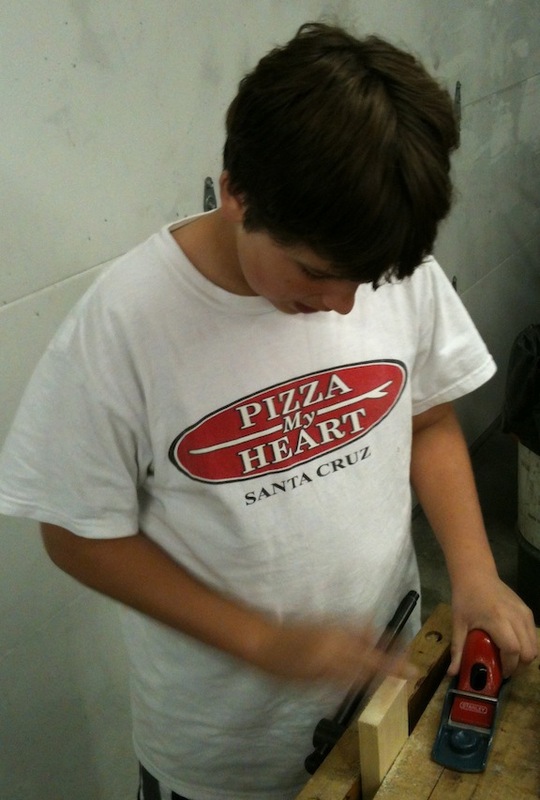 If anyone is just starting out and wants the late model #5 I’ll make you a, uhm, a Sweethart deal. 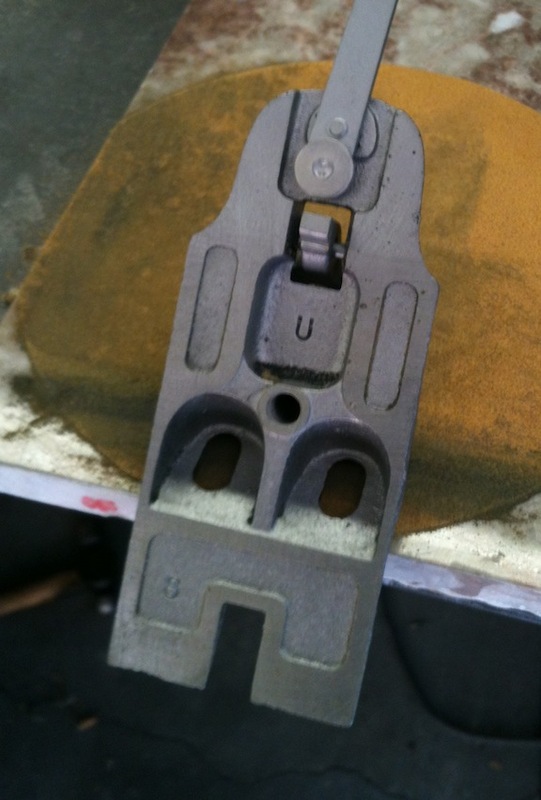 Next steps are to clean up the parts, re-assemble it and lap in the sole and sides. Then I’ll pull it apart for detailing and try to avoid getting carried away. Yesterday I talked about the Ivin Sickels book on hand tool woodworking exercises. Well, there is no place to begin better than the beginning. I stopped by the local lumber yard this morning and picked up a scrap of Western Red Cedar. Chris Schwarz recommends, in the video, getting a 2 x 4 from the local home center. But the local Home Despot gives is too overwhelming, and I prefer to support local businesses. Plus, the cedar smells really nice. 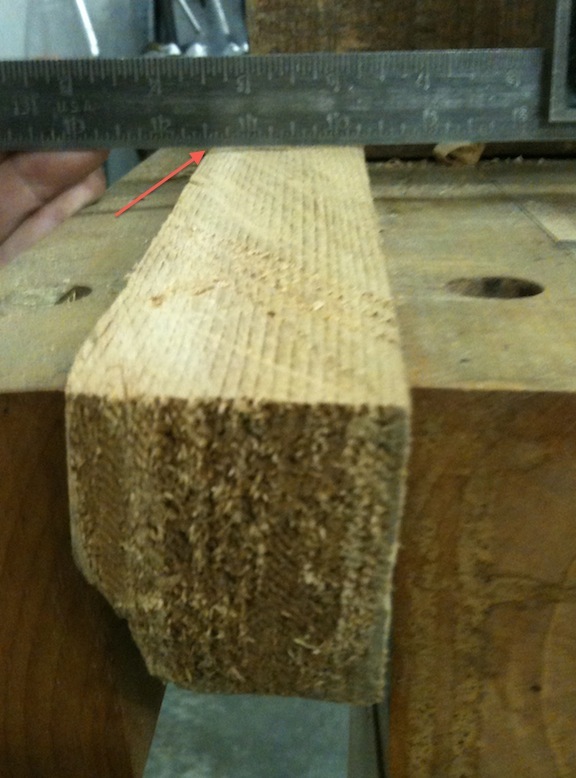 I cut off about 8″ from the 2 x 6 scrap I got, and ripped it into thirds. I’m going to package one of these rough blanks with the book/DVD I got for my brother-in-law. 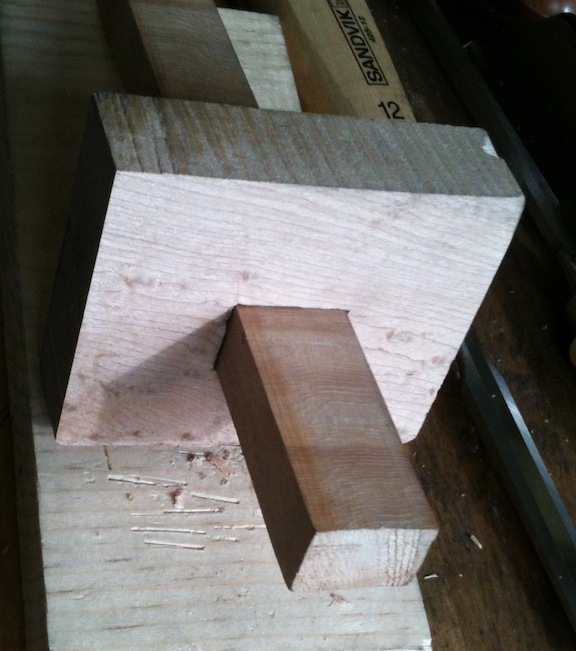 The first exercise is to make one face flat using the chisel. The book recommends starting with the bevel down. 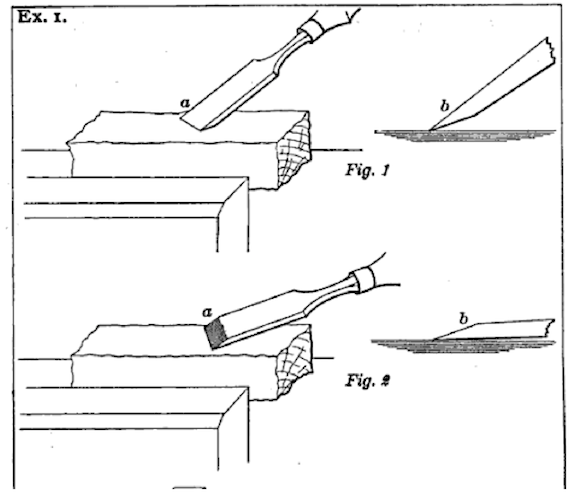 The drawings show the chisel held at about a 45 degree angle, with the bevel well off the face of the board. I didn’t find that orientation particularly useful. Having the bevel flat against the surface worked really nicely. I had a lot of control and could shave off high spots without risk of splintering or spelching. The face I was working was way off, it had a significant high spot in the back right corner, at least 1/8″ above the rest of the surface. You can see daylight (well, fluorescent light) under the left side of the rule. I marked the highest area with a red pen and attacked that first. I ended up having to pare away quite a bit of the face in order to get down to the low spots at the near edge of the board. Here I’ve removed the worst of the lump and the reae 1/3 of the board is relatively smooth. Everything so far was done with the beval down. If the chisel started to lift too big a shaving it was simple to pivot it and keep from digging in. It was hard to take a long shaving that way though. At this point I decided to try using the chisel bevel up and paring away material from the rear area to bring it down to the level of the front. It was too each to remove too much material that way and I ended up first with a small hump in the middle, then I had the surface flat, but too high all along the left edge. I got it flat after a few more minutes. 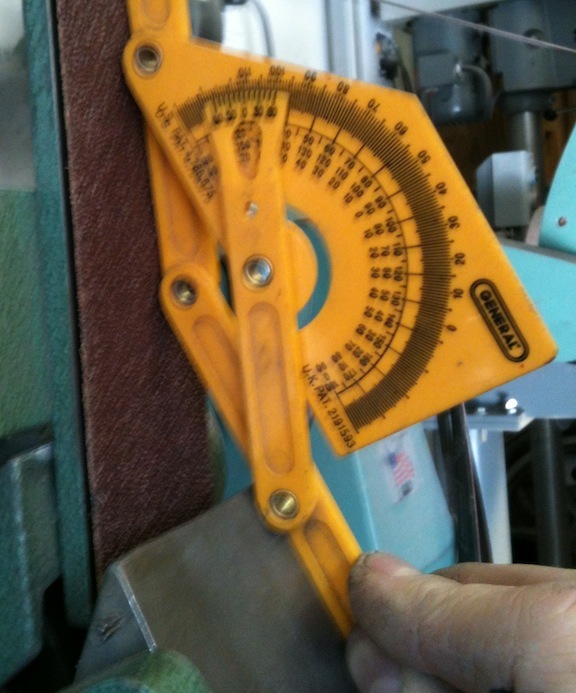 It helped to check with a straightedge, pare away material in a small area to address a problem and check again. I used the straightedge lengthwise, cross ways and diagonally. I got a reasonable surface after maybe 10 minutes total. The next step is to make an adjacent face flat and 90 degrees to the reference face I just created. Later. I need to make dinner now. 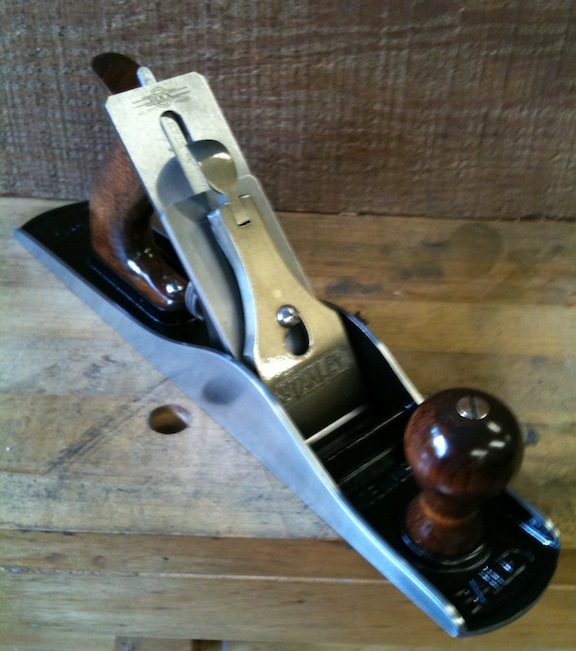 There are some really great resources available today for learning hand tool woodworking today. Maybe 10 years ago I did some woodworking – primarily using power tools – and this certainly wan’t the case then. The Krenov books were great (and still are), and there were other resources. 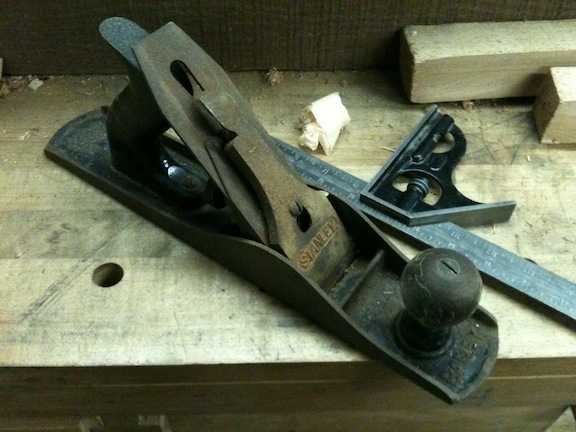 But there has been an ongoing resurgence in hand tool woodworking, and we’re all richer for it. I recently bought a package of two DVDs and a book called “Exercises in Woodworking“. The foundation of this is a book written in 1889 by Ivin Sickels. A scan of the book is also available on Google Books. I bought the reprinted copy with the two DVDs on a sale from Popular Woodworking, but you could get a lot out of just the (free) online book. The origins of the book was a manuscript that Sickels prepared for his students at the College of the City of New York. When I went to college there wasn’t a woodworking course option and I feel cheated. I’ve read most of the book and watched both DVDs. I plan to read the rest of the book of course, but it’s mixed in a stack of rwo dozen other woodworking books, videos and fantasy novels. The book has two main elements. The first is a “Short Treatise on Wood” that explains the properties of wood. The second part is a series of 39 exercises in hand tool woodworking beginning with the use of a chisel to smooth a board through joinery and finishing with veneering and finishing. Not all of the book exercises are covered on the DVDs. I like this package a lot, and even bought the same DVD+book package for my brother-in-law for Christmas. The first DVD has Christopher Schwarz demonstrating the first 8 lessons. 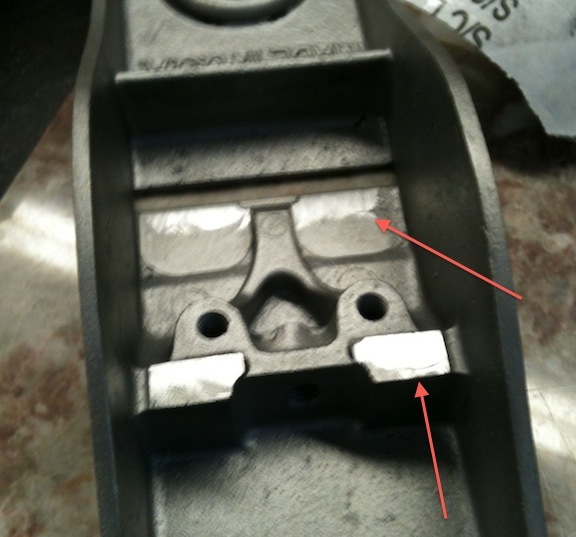 Chris begins by flattening one face of a 2″ x 2″ x 8″ block using just a chisel. 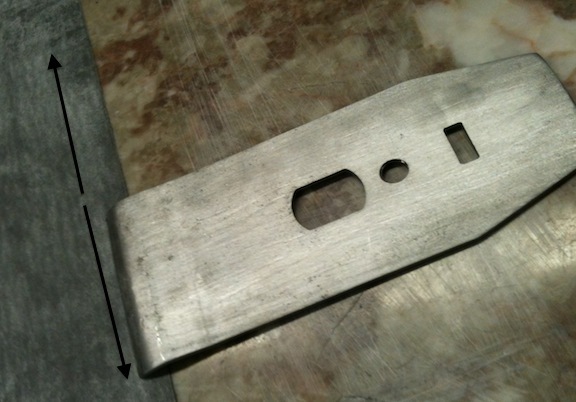 Interestingly, the initial work is done with the bevel down. I’m eager to give that a try. In fact I plan to start with that exercise and work through all of them, so expect to hear more about this book.